The need to rebuild stocks of rock lobster on the East Coast has led to the decision to delay the opening date for the recreational season in the ECSRZ. Other areas in the Eastern Region will now open at the same time as the Western Region. 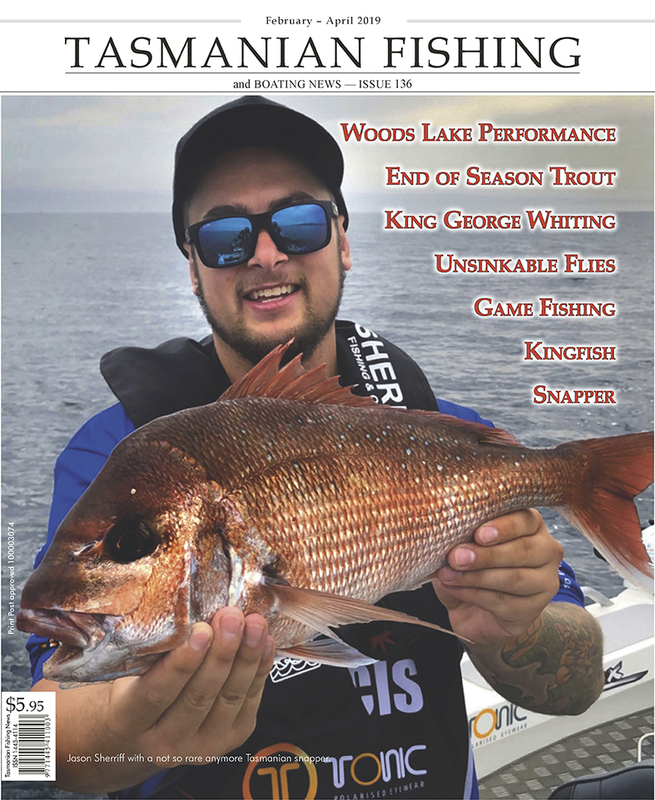 There are no changes to recreational catch limits. 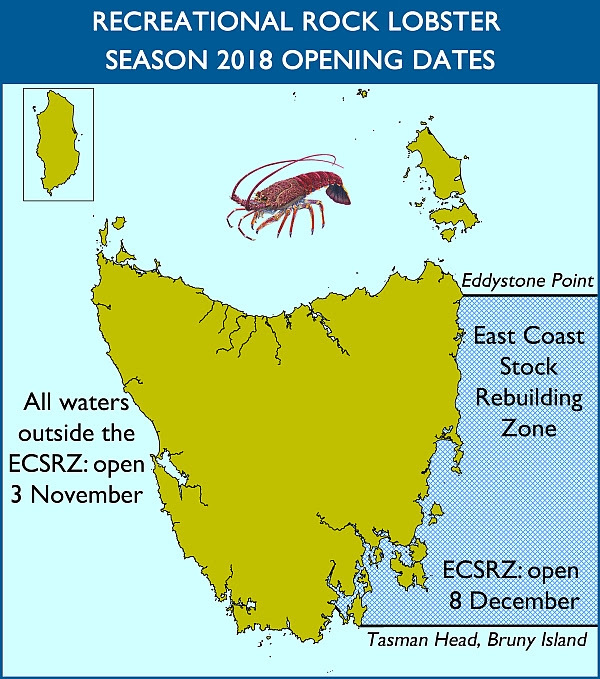 The commercial rock lobster season has also been delayed, opening on 15 November in all waters outside the ECSRZ and on 11 December in the ECSRZ. Put some warm clothes on and embrace the world. Winter fishing can be great. 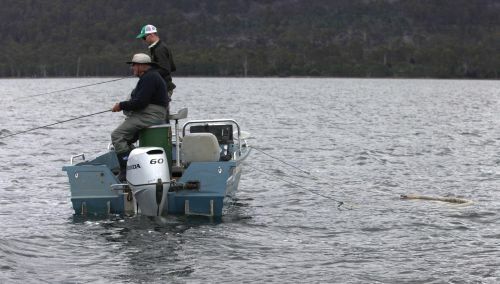 Great Lake is one of a handful of year round trout fishery in Tasmania that offers the die hard trout fisher a place to wet a line in fresh water. 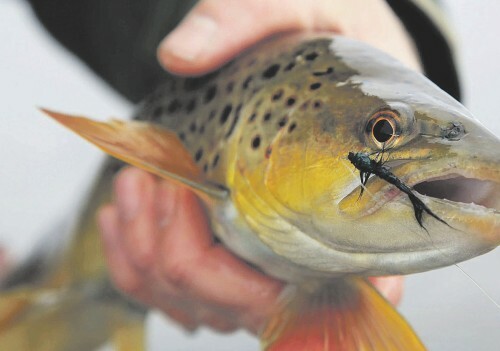 During the months of June and July, the brown trout that have finished spawning are looking to regain condition quickly. The Great Lake Galaxia will be high on their opportunistic diet at this time, making lure and streamer fly fishing a viable option. 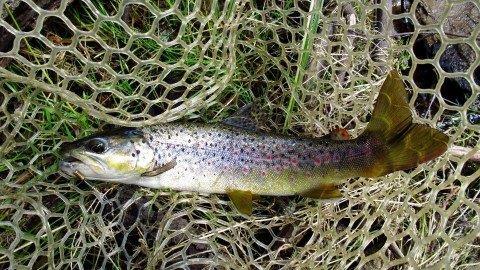 Shore based fishing is a good bet at this time of year with Browns hunting Galaxia along the rocky shorelines. 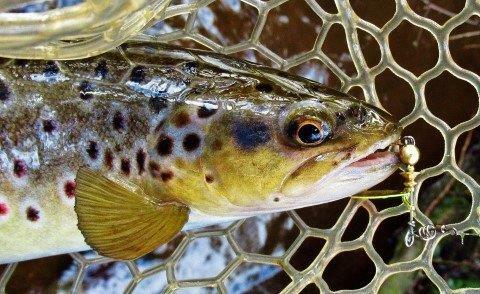 They also take advantage of the abundance of Stick Caddis over the weed beds and muddy bays. Fur fl ies, Woolly Buggers and streamers are great fl ies to use at this time of year. Cold weather can strike anytime in Tasmania and a lot of people complain about the cold constantly. 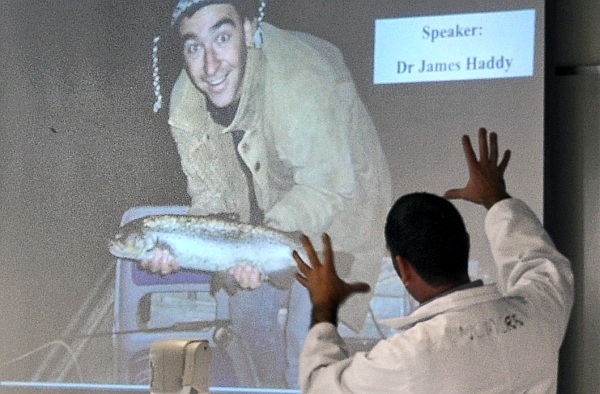 Anglers are no different, but, like bush walkers it just means more appropriate clothes. And if there is a huge winter frost you know the day will be calm and bright and a joy to experience. So while it can be wild, cold, bitter and wet look out for approaching high pressure systems, plan a trip, and rejoice in the short calm winter days. The fishing can be grand. 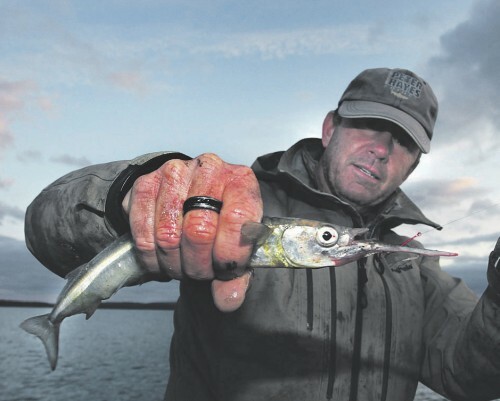 Two inshore fish that are fun to catch over Winter are garfish and flounder. Both are pretty reliable fisheries, but preparation is the key. 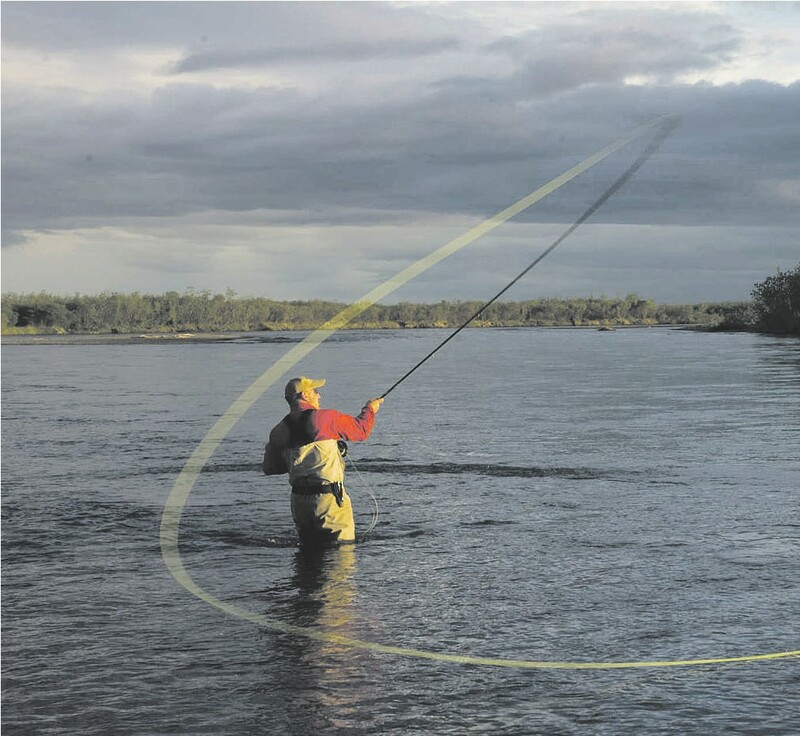 In fact it is the key to catching most fish. With the Mersey, Meander & Leven rivers still running very high and a day without rain plus a temperature of 15 degrees had me heading off to the tannin water for a spin session after a nine day lay off. 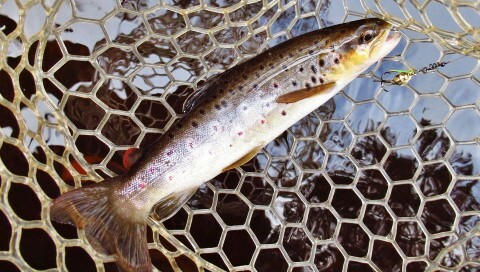 Until the larger rivers drop to a safe wading level I have no choice but to fish the little tannin water again. There was only one problem today and that was the wind, it was gusting at 50/60 kph from the North West so it wasn't going to be all that great for spin fishing. When I arrived I found the stream was running much higher than my last trip but still good enough to hop in and try and catch a trout or two. 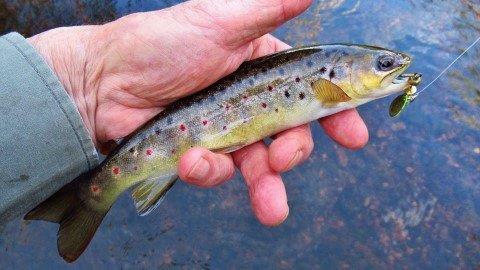 Like the past couple of river trips I started with the Mepps #0 Aglia tiger fluoro, it was on the forth cast when I picked up my first little wild brown trout in small flat water under some overhanging tea trees. More rain forecast again later in the day saw me head off to fish the tannin water again today in what was a much milder day than what we've previously been having. The reason I decided to fish the small stream was because the larger rivers are still running very cold & high, this little stream will be a little warmer than them. I arrived to see the level was lower than my last trip here back on 22nd August when it was cold and running at a medium height. I had a one & a half kilometre walk to where I started off the spin session & the lure of choice was a Mepps #0 Aglia tiger fluoro blade spinner. Join in discussions on local recreational fishing issues and hear presentations from IMAS researchers and DPIPWE fishery managers. With the Meander River level dropping to 73 cms in the Meander area I decided to head over there for a spin session. Even at 73 cms it's still a little on the high side and until it drops to 65 cms the water is still quite unsafe to wade in several areas along the river. Any way after arriving and then having a forty minute walk to the river I was finally in it flicking a little Mepps #00 gold aglia around in the river. The water temp here was sitting on six degrees which is still on the cold side for trout, hopefully things will turn around over the following weeks ahead. It only took ten minutes before I had a follow from a small brown before it made a dash at the spinner, it had one go at the gold aglia and missed taking it then darted off. I headed over to the Leven River only to find it was like the rivers closer to home, running to high & fast to fish so I went and checked out a small stream that flows into the Leven. I wasn't sure if it was worthwhile getting the wading gear on to give it a go or not. After standing there for at least ten minutes looking the stream in two minds should I or shouldn't I give it a go I finally decided to get the wading gear on. A twenty minute walk though down through some paddocks and thick bush I was in the river just on 2:15 PM.